Elegant food calls for elegant cutlery and this metallic look fork achieves the perfect balance between attractiveness and practicality. Although made from plastic and pleasantly light to handle, these forks have a rather distinguished look and feel to them. The contrast of shiny metallic look utensil with the sleek black handle simply oozes style. As the finishing touch to your sophisticated array of food choices, these forks will enhance any buffet table. 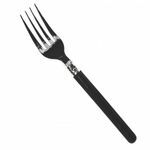 Disposable Metallic Look Forks with Black Handle x 48 has not been evaluated yet.